Welcome to the EliteFitness.com Bodybuilding Site! Please join this discussion about NPP- underrated and often times over looked within the Anabolic Steroids category. (NPP)Nandrolone Phenylpropionate was the first Nandrolone compound ever sold commercially. NPP emerged in the1950’s by Organon under the name Durabolin. Not long after Organon released its long estered cousin Deca Durabolin. Nandrolone Phenylpropionate has many therapeutic and performance benefits. 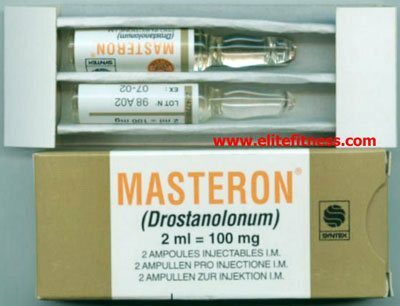 The Nandrolone hormone is the most commonly prescribed anabolic steroid other than testosterone, but the long estered Decanoate version is the most commonly prescribed Nandrolone form. It is one of the most well tolerated steroids. Nandrolone Phenylpropionate is identical to Nandrolone Decanoate. Both npp and deca are comprised of the same active hormone. With NPP we have a shorter ester that kicks ins faster after injection, but also carries a shorter half-life. This means Nandrolone Phenylpropionate has to be injected more frequently for blood levels to remain stable vs deca. Nandrolone Phenylpropionate is slightly more anabolic than testosterone with a rating of about 125 compared to testosterone’100. It is also significantly less androgenic with a rating of 37 compared to test with 100. The reduced androgenicity is due to the Nandrolone hormone reducing to dihydronandrolone (DHN) instead of dihydrotestosterone (DHT). This is one of the reasons Nandrolone Phenylpropionate can be tolerated so well at higher doses in comparison to higher doses of testosterone in some men. Nandrolone Phenylpropionate is also significantly less estrogenic than testosterone. Both Nandrolone and testosterone aromatize, but Nandrolone does so at about 20% the rate of testosterone. Nandrolone Phenylpropionate carries a progestin nature, and this will play into the side effects. This is one of the best mass builders available and for many bodybuilders is used in every bulking plan. Despite being a faster acting Nandrolone growth will not only occur rapidly, but it will be steady, even , and significant. You should also notice you stay leaner during your off season due to the metabolic effects of the hormone. And when it comes to recovery from strenuous training very few things will beat Nandrolone Phenylpropionate. Nandrolone Phenylpropionate can also be used for cutting cycles. Npp will protect lean muscle mass better than many steroids. When we diet/cut we burn more calories than we consume. Unfortunately, this puts lean muscle tissue at risk, and NPP can provide the protection We need and minimize muscle loss. And again the recovery benefits will be tremendous, even when in a caloric deficit. Again Many athletes will use low doses of Nandrolone Phenylpropionate for the recovery and joint relief benefits alone. For the athlete or bodybuilder doses can vary greatly. 200mg per week is commonly seen for therapeutic relief. cycle doses will range from 200-800mg a week. Usually for 12weeks. NPP is One of my all time favorite compounds. Unlike tren , You can do cardio until your heart is content and not worry about the dreaded breathing problems you get with tren, and no Trensomnia or heartburn ... Your muscles stay and look full all day long. I do sweat a lot while on npp. So be warned. Excellent stack - test / npp/ mast. Npp is very versatile. NPP is Great for Recomp or adding lean mass without holding much water/bloat. In my opinion one of the most underutilized and under appreciated compounds out there. ask me for coupons to N2bm, juvepharma, sarms1 etc. Very good summary, Thank You Mace! Love Nandrolone. I prefer deca just so I can pin less. Grab some of the smoothest npp you will ever try at a Heavily discounted price!! Doesnt get any better than PSL. Platinum Search! The largest bodybuilding archive in the world! NPP 200mg EOD vs NPP 100mg ED ??? BICEPS-The most underrated muscle in Powerlifting!! [email protected]@K! All times are GMT -4. The time now is 05:01 AM.